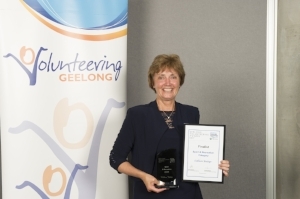 Volunteering Geelong supported by Kardinia Rotary Club hosted the inaugural Geelong Volunteering Awards 2017 at the Presidents Room, Simonds Stadium. Over 110 people attended the evening and Awards were presented across 8 categories. Winners (left to right) Colleen Batty - Sport and Recreation, Pauline Tournier - Excellence in Volunteer Management (unpaid role), Jim Watson - Environment, Animal care & Conservation, Keith Stasinowsky - Arts, Heritage & Tourism, Bec Picone - Community Care & Health, Graham Smith - Emergency Services, Derek Ryan - Education & Training and Natalia Davey - Excellence in Volunteer Management. Sponsors for the event also included Geelong Connected Communities, Access Your Support and Standby Security. Keith is currently President of the Portarlington Bayside Miniature Railway and has shown leadership and inspiration to ensure the continued viability of this popular tourist attraction. Keith has volunteered since the mid 1990’s to make the railway an enduring tourism benefit to the local community and the railway also supports other local charities. Keith has been hands on in his roles over many years and is a true reflection of a dedicated and supportive volunteer. Jim assists Conservation Volunteers Australia each week to undertake practical environmental activities around Geelong. Jim works in partnership with regional councils, national parks, landcare groups, conservation departments and other conservation agencies. Jim loves the ‘sense of pride when you look at the work done each day and no weed is safe when Jim is around! Bec and her brother Clinton started the Peace of Mind Foundation as they saw an incredible need. Bec is now the driver of the group. She is enthusiastic, hardworking, reliable, dependable and compassionate. For the last 4 years Bec has worked tirelessly to raise awareness of Brain Cancer, support sufferers and their families, connect families to services and fundraise. Peace of Mind host the only Australian Brain Cancer Retreats; a men's, a women's and a family retreat, all organised by Bec here locally in this region. She inspires others to volunteer at these retreats and at all fundraisers. 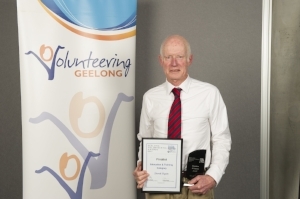 Derek volunteers weekly assisting at Geelong High School in science and maths classes, supporting young male students in a wellbeing program and helps deliver the Yr 9 community service program. Derek’s volunteering has had a direct impact on student outcomes and has been a tremendous role model for all members of the school community. He has a calming influence, respectful interactions and his ability to provide clear guidance and help focus their thoughts of the students combined with his commitment and patience have improved the lives of many students at the school. Graham’s roles include duty officer, deputy controller – operations and crew leader. As one of 4 duty officers Graham monitors messages 24/7 so that the unit can respond to a call for assistance quickly and efficiently. Graham ensures that all members of the unit operate in a safe manner and the fact that there have been no injury reports associated with turnouts that Graham has led (452 in total over seven years) is a credit to his leadership and supervision of new and existing SES crew members. Colleen has led the community effort in developing the Sutherlands Creek Reserve a former primary school site. As a result the Reserve has changed from a relatively abandoned area to a vibrant natural bush site with amenities for all to use, including tennis courts and open space.Colleen works to inspire young and old, giving of her time and talent always, so everyone feels welcome to visit the Tennis Clubrooms and Sutherlands Creek Reserve. Pauline has constantly guided, mentored and helped out communities in many ways. The support she has provided to community groups has meant they have been able to make such a difference to these country communities. She works tirelessly to help others achieve great community outcomes and ensures that there are plans in place to keep the area vibrant and sustainable into the future. Natalie Davey is Cherished Pets Foundation (CPF)’s Project Manager. In this role she is responsible for the management, design, delivery and measurement of a unique community pet care project that provides in home pet care support to eligible elderly and disabled residents in our community. Natalie has developed from scratch a professional volunteer program and manages the promotion, recruitment, selection and orientation of volunteers. Her work ensures that CPF builds a strong foundation for the programs continued growth. Stay tuned for more information about 2018 Awards in early 2018.